I should start this by saying I believe Bacchus is closed now. But I’ll forge ahead anyway. E, S and I were looking for a place to go for a Saturday lunch with our boys right before Christmas. When the first few pubs we tried wouldn’t take reservations, I remembered Bacchus – I’ve been here both in its previous incarnation as a fine dining restaurant but also in its current pub form and enjoyed both. At 2.30pm this day, it was essentially empty and we noticed loving goodbyes scrawled on some walls and pillars – indications that we were there for the last throes. 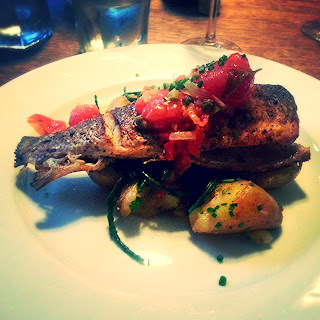 But nevermind, my sea bass was still great, with crisp skin and fluffy roast potatoes underneath. A’s fish pie was good as well, and our two bottles of red helped us all celebrate merrily. And our final chocolate mousse with some tart Morello cherries was much darker and richer than expected, making the portion size perfect. So farewell, Bacchus – I hope something great comes back in your place.